Lots of restaurants stay open for the Easter holiday – many serve a special Easter brunch or dinner for customers to enjoy the day without having to slave away in their kitchens. Perhaps your restaurant manager is planning on having some special promotions to make sure customers fill the restaurant on Easter. Many hotels are all booked up for Easter weekend, when people like to visit relatives to spend this special holiday together. That means that restaurants at hotels are often brimming with activity on Easter weekend. Easter is only a few short weeks away – are you and the rest of your commercial kitchen’s staff ready? Aside from the basic essential preparations – planning the menu, booking the reservations, setting up the seating chart, putting up special Easter decorations, etc. 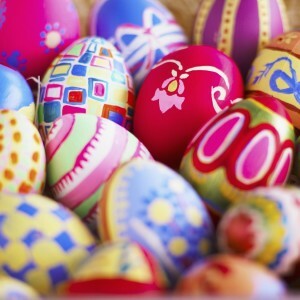 – you should definitely make sure your kitchen is in tip-top shape for an extra busy Easter weekend. Make sure your kitchen exhaust is squeaky clean by calling the commercial kitchen exhaust cleaning experts at Flue Steam. Whether you’d like to schedule a one-time cleaning or set up a regular cleaning schedule, we can handle all your exhaust cleaning needs. We’re Southern California’s exhaust cleaning experts – thousands of commercial kitchen managers throughout the area have depended on the cleaning services provided by Flue Steam to make their lives easier. Take this essential task permanently off your plate by enlisting Flue Steam to handle all your kitchen exhaust cleaning needs from now on. Why does your kitchen exhaust need to be professionally cleaned? During the cooking process, grease evaporates and becomes stuck throughout your kitchen exhaust system. If it’s not removed frequently and effectively, it can create a major fire hazard. 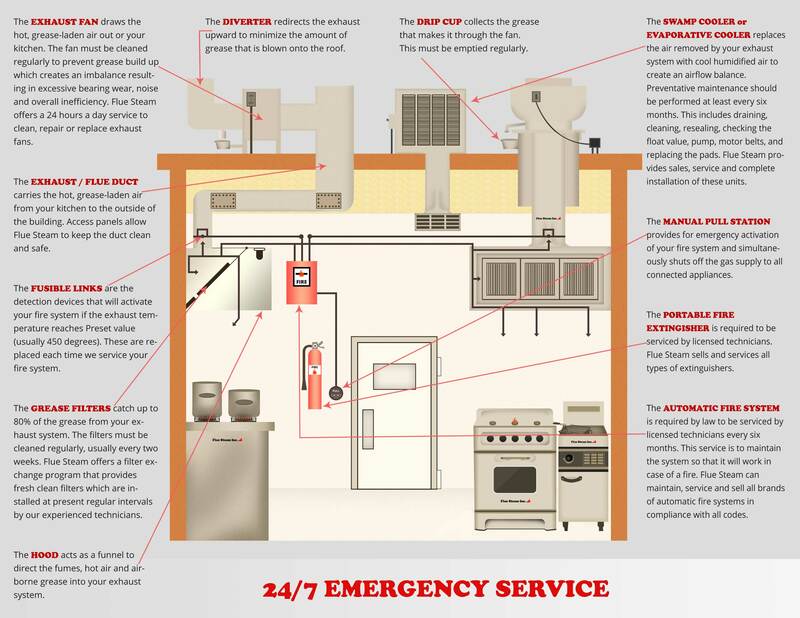 Flash fires may happen in your commercial kitchen – requiring a call to the fire department, potential damage to your kitchen, and a day or more of lost business. Plus you may be fined for a fire code violation because California law indicates that commercial kitchen exhaust systems must be cleaned regularly. While it’s possible for your kitchen staff to handle the hand-scraping of your exhaust system, you would need to have specialized equipment and training to steam clean it properly. Flue Steam has all the necessary tools and techniques to ensure your kitchen exhaust system is regularly cleaned perfectly. Flue Steam has been serving commercial kitchens throughout Southern California for over 48 years. We’re here to fulfill all your kitchen exhaust system cleaning needs. Whether you call us for occasional cleaning services or sign up for regular exhaust cleanings so you won’t have to worry about it anymore, we strive to build a lasting professional relationship with every single person we meet. We look forward to helping make sure your commercial kitchen is always up to code and ready for busy weekends – including Easter. Schedule your kitchen exhaust cleaning services now by calling 800-700-FLUE or emailing contact@fluesteam.com.